Updated Saturday October 13, 2018 by Becky Barlow. 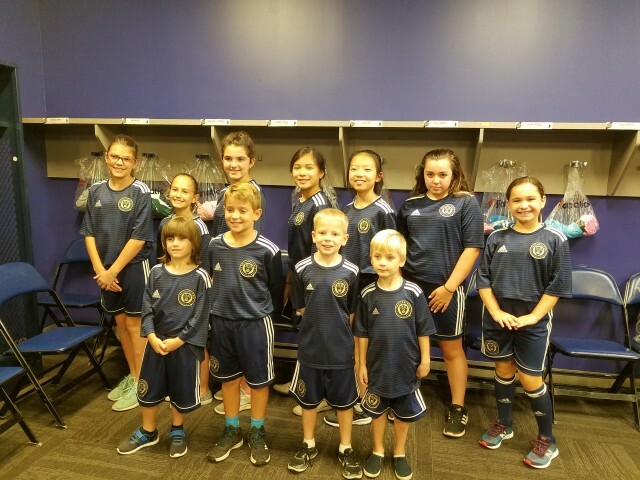 Eleven lucky CBAA/Buckingham Soccer Players escorted the Philadelphia Union Players onto Talen Energy Field at the Union vs. Minnesota United Game. Parent, Rachael Frazier was our Photojournalist. Here is her report. My experience chaperoning the kids was just awesome. Everyone loved it! Before the game, our kids were brought into the locker room and given Union uniforms to change into and to keep. They spent time getting to know one another as the anticipation grew, they were so excited. It was fantastic that the CBAA/ Buckingham Soccer Escorts walked with the Union players onto Talen Energy Field. Everyone all had big smiles on their faces throughout this wonderful event! Our Players stood with their Union and sang the national anthem. Overall it was a great experience for everyone, even us adults.